Introduction and useful information for hiking the Janapar Trail. Please read this and the Janapar Trail Descriptions before your hike. Some sections of the trail are much easier than others. Read the trail descriptions to find which parts are most suitable for you. How much of the Janapar Trail should I hike? Day-hike -- many people have hiked parts of the Janapar Trail without even knowing it. The hike from Shushi to the Zontik Waterfall, hiking around the 2,000 year old tree of Skhtorashen, or up to Gtichavank Monastery. It's easy to pick a nice bit of trail and do a morning or full-day hike. Weekend trip -- if you don't have the time for a longer hike, you can choose a 2 or 3 day stretch to hike, and see some of the highlights of the Janapar Trail. Shushi to Avetaranots (or Skhtorashen), Avetaranots to Togh, Badara to Gandzasar, and Vardenis to Gandzasar are all rewarding, though the latter two can be challenging. Long-distance hike -- a hike of a week, two, or the entire Janapar Trail is a very rewarding experience, allowing you to see the changes in the landscapes, the architecture and the villages along the way. Once you've decided on the type of hike you're interested in, you can decideif you're physically ready for the hike, and make sure you have good hiking shoes and clothes for various weather condition and temperatures along the way. Practice hikes with a backpack are a good way to condition yourself for the trail. When you've decided on where you'll be hiking, read the trail descriptions carefully, study the maps, and print these all out to have a hard copy of with you on the trail. Download one of the smartphone apps that have the Janapar Trail on them, and practice using the app until you are comfortable using it before departing for your hiking trip. If you haven't decided when to hike the Janapar Trail, you should consider what each season has to offer. Spring can be wet and cool, with the landscape growing more unbelievably green with each passing day. Early summer still isn't too hot, and the late spring-early summer wildflower displays are still at their peak, while conditions are a bit drier. By mid-late summer, temperatures are hot at lower elevations, while more and more fruits and vegetables become ripe along the way. Fall is beautiful, with comfortable temperatures and an abundant harvest. The landscape will have dried out a fair bit in most parts, and later in fall the leaves will begin a beatiful display of fall color along many parts of the trail. Winter hiking is not for everyone, but for those who enjoy it, there will be snow along much of the trail, and a lot of solitude. Do the locals speak my language? More likely than not they don't, but it does not matter. It's amazing how much can be communicated with gestures, a few words, and a little alcohol. Very few hikers speak a language in common with the locals, and that doesn't impede any of them in experiencing the great hospitality and culture of the locals, and of course seeing the universal beauty of the natural environment and the ancient architecture. If you speak Armenian or Russian however, you are of course in luck, and even Turkish will help a lot since many older locals still know Azeri. There are some English speakers, and kids are learning it in schools, plus there are some French and German speakers, but they're very few. Just have a few key phrases handy and be ready for some pointing and miming. Should I bring maps, guides, etc? Most people follow the marked trail without issues, but it's highly recommended to print out the maps, the trail descriptions and have either a smartphone with the Janapar Trail on an app or a GPS with you. Reading the trail description each morning before your hike and having it along with you will give you a good picture of what your hike will be like, and you'll know to look for certain changes in terrain, or sharp turns you don't want to miss. It's easy to take these things along and safer. Unmarked sections require printed maps, guides and either a smartphone or gps device which have the Janapar Trail tracks on them. Familiarize yourself with the app or gps device before embarking on the trail, and preserve batteries by turning these off when not needed. Why does the mileage of various sections vary so much? You'll notice that sections can vary a fair amount in length. A section could be shorter because the next village would have been too far for a day hike for most. It could be shorter because there is a lot to see or explore when you arrive (a hot spring, an interesting town, etc). Or it could be longer because the terrain is flat and easy, or the distance to the next town required a bit longer of a hike than other sections. You can in some cases hike double sections of trail, for example going from Stepanakert to Shushi and on to Karintak in one day. This would not allow you time to explore the very interesting town of Shushi however. You can also over-shoot or under-shoot the designated overnight village and stay in one of your choice if there is one convenient. You will be able to find a homestay even if no organized homestay exists. How do I avoid drinking Oghi (Vodka)? One of the most important skills you may need to learn in order to complete the hike is how to avoid drinking oghi, a homemade drink something like vodka. It is a very potent drink, usually over 50% alcohol, and the homemade stuff is excellent, but it will probably make hiking the next day much more challenging, especially if it happens night after night. But drinking is a big part of local culture and hospitality, as are toasts, so here are some ways to try to find a balance. You can refuse. Don't try excuses like stomachache or illness, most Karabakhtsis will only insist this is the perfect cure for virtually any ailment you can find in a medical book. You can simply say you don't like it. You can say you prefer wine or beer. You can simply say okay but only touch it to your lips or have the tiniest of sips. If you would rather not play along, and don't want to sip a beer or wine, you smile, and say thank you, but no. As many times as it takes. Leave No Trace is the simple concept of visiting a place without altering it, or leaving it for the worse. Don't bushwhack, don't trample or harm unspoiled nature, don't feed wildlife, don't leave anything behind (litter) and don't take anything like flowers or artifacts you find with you. The concept of leave no trace is still new along the Janapar, and explaining it to locals when appropriate is a good way to share something good with them. Some communities do not have any proper waste management, and trash is often burned or improperly disposed of, but still clearing up your own trash and sometimes that of others when it is out in nature can be a good example. The Janapar Trail was designed to make it possible to stay at different homestays each night. This gives hikers a great opportunity to meet locals and avoid carrying excessive gear. While some homestay options are listed for the overnight villages, finding your own can be fun as well. It's often as easy as entering a village and asking someone if they know anyone that accepts guests (gitek mard vor gisheru hyur e untunum). Most villagers have very little disposable income, so conditions can vary significantly from home to home, which is one reason you may prefer to stick with homestays that are listed with their conditions described. Especially if you're not looking to rough it more than necessary. Most homes are clean and usually a simple dinner spread can be put out surprisingly quickly, but there is usually not going to be a shower, and toilets may be in the home, or may be outside, sit or squat, there is a lot of variation. Many villagers not listed as homestays will be too proud to accept money, though you must insist, and find a way to leave a little something behind by insisting a few times that it's a small something for the children, or something along those lines to allow them to accept it. Or you may have to leave it back on your bed. Of course human nature being what it is, you may sometimes be asked to pay something you find unreasonable. Do not be afraid to show that you are surprised, that you find it too much, and to say so. It's a give and take. Your input after your hike on places you have stayed, the conditions, and the likeability of the hosts is very important to us in helping others find the right homestay. Please rate them online, or add them if they're not listed online yet. We can help if you have difficulty with this. Your online feedback, either positive or negative will help hikers who come after you! Most of the countryside is open to camping. If you find a spot where you are not going to harm a crop or anything else by setting up a tent, you are almost always welcome to do so. Most villagers would also be happy to allow you to camp in their gardens, though they'd probably prefer you stayed in their homes. Established campgrounds are still rare, but if you come across a maintained area where others camp, you will probably be asked for a small camping fee by the groundskeeper who maintains the area or at the very least keeps it clear of trash. In keeping with the leave no trace principles, you should take care to minimize your impact in pristine areas. In such areas, try to avoid places that show the beginnings of frequent use, so that they may recover. Set up tents on durable surfaces like dead leaves or grass, at a good distance from other tents, and at least 70 paces from streams or ponds. Avoid trampling plants. If you have a campfire, make sure to put it out thoroughly before going to sleep. Most Westerners can enter Armenia for 120 days visa-free, however unless you have an Armenian passport or residency permit, you will need a visa to visit the Mountainous Republic of Karabakh. This can be issued in Yerevan or Stepanakert. If you're arriving in Stepanakert before your hike, you can get your visa issued and register it at the Ministry of Foreign Affairs in Stepanakert all at once. What should a day-hiker pack? What should a beginner backpacker pack? What clothes are best for the hike? What footwear is best for the hike? A solid pair of hiking boots that you've already broken in if necessary is best. A pair of Teva or other water shoes are quite helpful for crossing the occasional river if necessary. Should I bring a mobile phone? A mobile phone is a great tool these days for mapping and emergency aid (where there is reception). Download the trail tracks and keep your phone turned off when it's not in use to preserve batteries. Charge at every occasion, and perhaps bring a solar charger. You can get a SIM card upon arrival in Armenia. Every village will have at the least a little market that sells some basics. Bread, cheese, pasta, rice, water, soda, chocolate, tea, coffee, very poor quality batteries, and other miscellaneous things which aren't produced by most people in the village. You'll want to avoid drinking water without treating it first. Some will risk drinking from mountain springs, which are usually pure, but it's always safest to treat water from streams and even pipes with tablets or UV in order to avoid gastrointestinal issues that could spoil your hike. Sheep or wildlife near a stream could easily contaminate it with Giardia, tapeworms, E. coli or other diseases. Make sure you're ready to either treat water, or carry the water you need because one of the most important things to ensure during a hike is that you stay hydrated. In spring you will encounter a lot of water along the route, by mid summer some of these will dry out. Taking along enough water for each days hike is always safest if there are no villages along the way. Along the hike, you will be taking care of this in nature. Disposing of waste responsibly is important for sanitation, for the experience of other hikers, for keeping good relations between hikers and villagers, and for keeping with Leave No Trace practices. You should have a lightweight trowel along your hike, and dig a 15-20cm (6-8 inch) hole to bury waste in. Feces should be buried at a minimum of 70 paces away from water or any trail. Before covering the waste, mix in some soil with a stick in order to discourage wildlife from digging it up, and to quicken decomposition. Bury your used toilet paper along with your waste. Sanitary napkins, wet wipes and other hygiene products should be packed into ziplocks and carried out. Don't forget that as many hikers get sick from inadequate hand washing as from bad water. Wash your hands with bio-degradable soap or use hand sanitizer after defecating - the hand washing with any soap should be done at least 70 paces from a water source. If you share food, do so without touching one anothers food. How pace should I maintain? When should I expect to see blazes? Does the trail route ever change? Have some supplies with you that can help in case of problems. Lighters to start signal fires or keep warm, loud whistle to help people locate you, bright bandana or scarf, telephone, etc. Women hikers should not travel solo, and are safest being reserved when interacting with men of all ages. In the conservative culture, some men will interpret what would be considered normal friendliness by a woman in the West as very serious interest in a physical encounter. To stereotype, Armenians are patriotic, even while being quick to point out the shortcomings of their government. They tend to the conservative, though they don't usually apply their standards to visitors. And above all, Armenians take great pride in their legendary hospitality. Most villagers who have virtually nothing will share everything and take the time to help a visitor in need. Invitations into ones home for a drink or a meal, or an offer of a string-free place to sleep are common. We hope that hikers will be able to strike a balance of accepting some hospitality, and giving back, while preserving the genuinness of the local openness. For overnight stops in villages, romance with a local is not a good idea. Casual fun might cause you complications, or it might make life more difficult for hikers who follow in your footsteps. Women hikers should follow the advice in the safety section, and should not travel alone. Yes, including poisonous snakes. Take precautions and learn how to react in the case of a snake bite. Taking a cheap snake bite kit may be helpful as well. What other creatures should I know about? You will probably not encounter the following animals, but then again there's always a small chance you will. Wild Cats, Wolves, Boars, Porcupines. Yes, there are rarely seen small brown bears. What safety equipment is a good idea on the trail? Phone, loud whistle, flashlight, first aid kit, high calorie snacks, mylar foil emergency blanket (super tiny and light). It's important to get good quality fitting boots, and socks made specifically for hiking, then wearing them a few times on progressively longer walks to break them in before starting to hike the Janapar Trail. Packing some rubber teva type sandals for river crossings will help keep your socks and boots dry, which is also critical for preventing blisters. Pack moleskin bandaids specifically made for blisters, just in case you get blisters despite your best efforts. At higher elevations and in the winter, hypothermia is something to think about and prepare for. Staying dry and having warm clothes, sleeping bag, tent, etc, as well as keeping your calorie intake high are important. How do I prevent heat emergencies? Who can attempt a thru-hike? When should I start a thru-hike? Which direction should I hike in? In 2006 the concept of a long distance trail starting in Armenia and extending through Artsakh was born with 2007 seeing the trail defined and much of it marked. It would lead past many natural and historic-architectural highlights, while giving a much more in-depth experience. Funding came from the Hovnanian Foundation and the implementation of the project was planned and overseen by Raffi Kojian. The trail came together by connecting historic foot paths and jeep tracks through Artsakh's backcountry. The trail was designed so that hikers would end each days hike in a village or a town where they could stay in local homestays without needing to bring camping gear. This would allow them to experience first hand the incredible hospitality of the people and experience the local culture better. Those who did prefer to bring gear would of course have the option to camp as well. Funding ended in 2007. Even as adventurous hikers started hiking the trail, the signage began to deteriorate. In 2012, work was done to renew the trail markings in the southern portion of the trail, between Stepanakert and Hadrut. The trail was extended into Armenia, and as hiking apps grew in popularity, the trail was added to apps in order to make following it even easier. This work was completed by the efforts and funds of Raffi and some friends (the Niziblian brothers), as well as volunteers from Birthright Armenia. Additional trail marking work was done by Birthright Armenia volunteers in 2014. In 2016 Raffi oversaw and funded the scouting of an extension even further into Armenia from Vardenis to Yerevan. This portion has been completely scouted and the tracks have been added to the hiking app as an unmarked extension. There are no plans currently to mark this trail. In 2017 Hans (of Bellfree Contractors in Los Angeles) and Gevorg (of Arevi Tours) worked on clearing the Janapar Trail in preparation for the trail run by ultramarathoner Telma Altoon. Later in the year Hans founded the Trails for Change NGO in Armenia and brought a trained team to Artsakh from Armenia to do additional trail work and add signage, as well as revamp the homestay information. Also late in the year, Raffi did some scouting related to reroutes of the trail, with the help of Dmitry, also known as Mazzoniguide, and Trails for Change did a revised village-by-village homestay assessment to create an up-to-date homestay list. Early 2018 saw a crowdfunding campaign by the Janapar project allowing Trails for Change to bring trail markers to the entire trail, and do other trail maintenance. 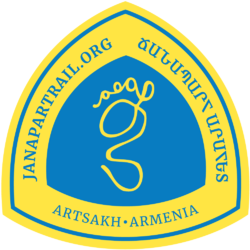 Armenia's Armenian Hiking Association is planning to do some trail work on one of the Janapar Trail sections, and as of 2018 the government of Artsakh is planning to help with trail building and maintenance as well. This page was last modified on 30 August 2018, at 11:15.